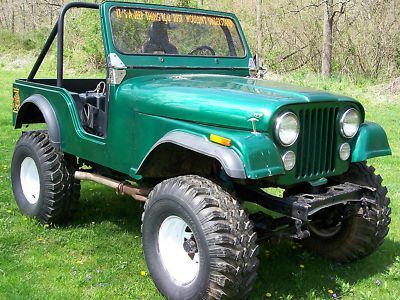 This auction is for a 1975 Jeep CJ-5 that's been lifted and set up to do some mudbogging. 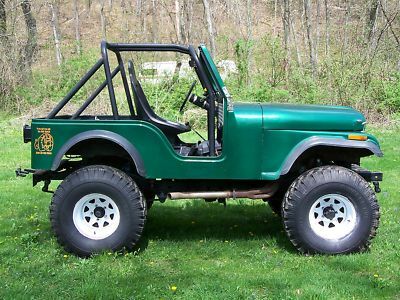 This Jeep has a fiberglass body and nice green metallic paint. It's got a suspension lift, and a body lift. The tires are 36" mudders on 15x10" inch wheels. The motor is a 304 V-8, and it runs and sounds great. The three speed transmission and four wheel drive both work properly . Everthing is manual except the power disc brakes. I cannot say what the actual mileage is, as it has no odometer. The title is clean. It has a monster tach, fiberglass racing seat, fuel cell and a new battery. I have no idea what the axle gear ratios are. 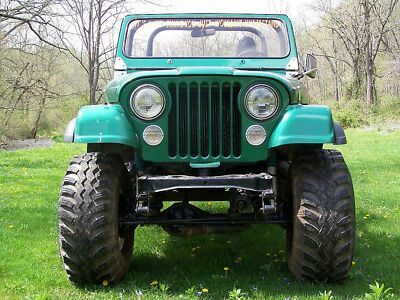 This jeep starts right up and runs good. It steers and stops. 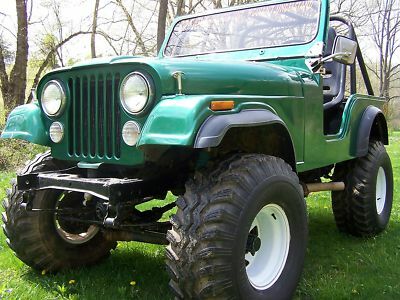 This is a great off-road jeep and would be at home in the mud bog, or on the beach. It would take some effort to make it highway legal again, but it could be done. If you like Jeeps, this has a ton of potential. *Please ask any questions prior to bidding. I will do my best to answer your questions in a timely manner. As always, it's advisable to come and see the vehicle for yourself prior to bidding, if possible. I can be reached by email, or you may reach me by telephone at (717) 578-0914. If you win the auction, it's your Jeep. Please understand that I will report winning bidders/buyers who cannot or will not complete the transaction. Winning bidder is responsible for shipping/delivery, although I may be able to deliver by insured flatbed truck, at a rate of $1.75/ mile, provided you make arrangements with me to do so prior to the end of the auction.